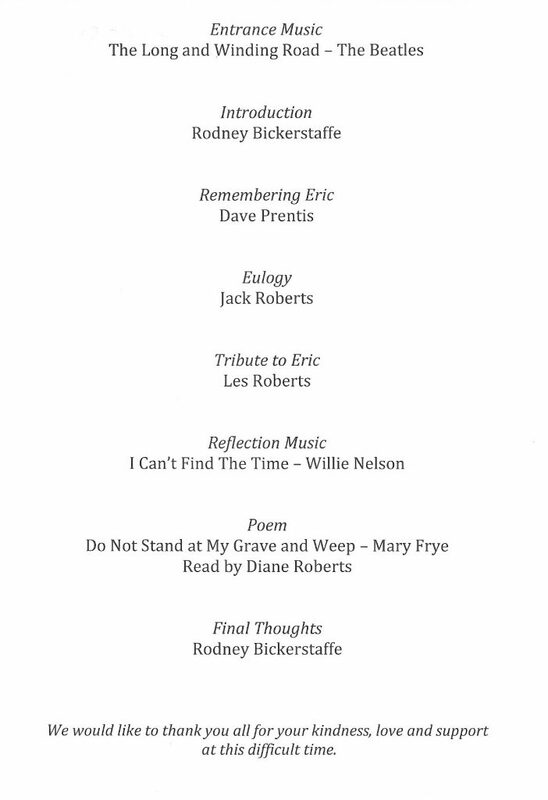 Eric’s funeral was held at Harwood Park Crematorium on December 16th, 2016. This page is dedicated to that day. Rodney Bickerstaffe, former general secretary of NUPE, conducted the service. This was such a fitting choice. 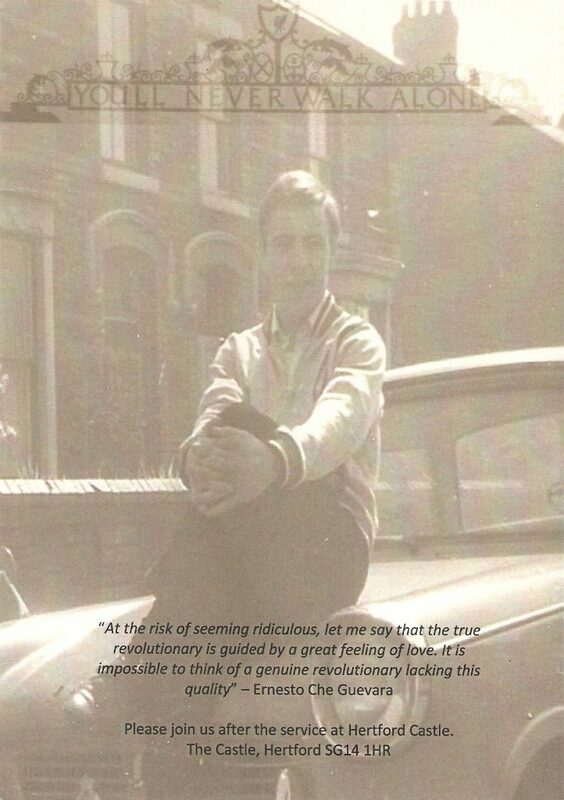 Rodney (“Bick”) was a hero and friend to Eric, and is a humble, generous and principled man. Who better to conduct the event that helped us say goodbye to our Eric, who embodied these same characteristics himself? Wonderful words were spoken by Dave Prentis, General Secretary of Unison, by Jack, Eric’s son, and by Les, his oldest brother. They all spoke personally from their own hearts and they also spoke for us all. It was a beautiful occasion. Heartbreaking, and beautiful at the same time. 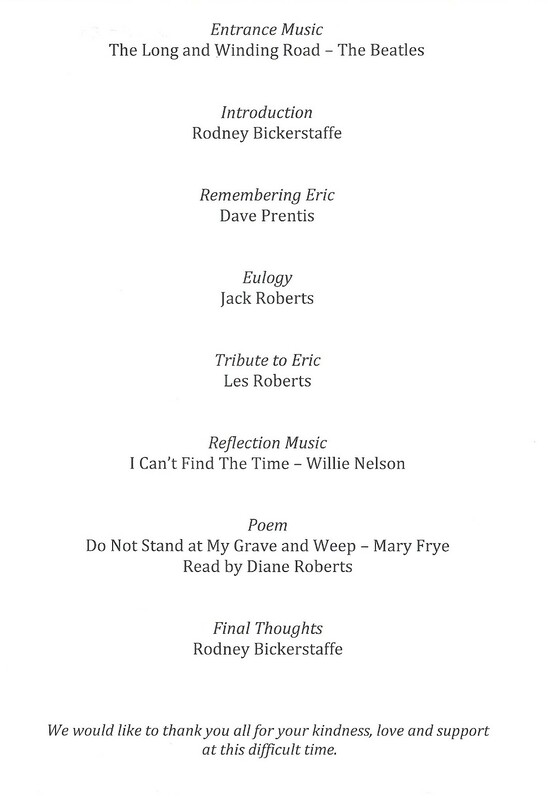 Eric Roberts, my Dad, was a sweet kind and generous man. He was warm and funny, protective and loyal, humble and proud and he was very, very brave. To his family especially, he was a ray of sunshine. He made everything better. Any occasion was improved by him being there as he was such good company. Full of jokes and enthusiasm. Always happy with that beautiful, infectious smile. My Dad was a real family man and his family meant everything to him. After the sad death of my cousin Kenneth, my Dad arranged a family meal so that we could all be together. He made a beautiful, loving, moving speech. At least I’m told he did – he forgot to check that everyone was present so I came back from the toilet to find everyone crying! He loved spending time with his brothers and it always felt that that was when he was in his element, telling stories and jokes, always making everybody laugh. Dad and his brothers are a testament to the love of my Nana and Grandad as they are all the kindest most decent of men. He was the most perfect, loving Dad. Rhian and I adored him and he adored us. We would have so much fun together. He was great to be around. There are little things that Rhian and I remember about him that were constant and reassuring. Things that he would say to us as adults that he had said to us since we were children. Like if we went into a shop together he would say – ‘normal rules’ and that meant that we can look around on our own but can’t leave the shop! My Dad loved us and he always made us feel so special. He loved to spoil us but mostly he just wanted to be in our company. Nothing will ever be the same again. We can’t imagine Christmas without him there to make sure we are all having fun. He would turn up a few days before Christmas with bags and bags of presents. Every year I’d tell him – don’t go mad this year – and every year would be the same, he’d turn our living room into Santas Grotto. He loved to give, much, much more than he liked to receive. If you were his friend and he saw something that he knew you would like, he would buy it for and give it to you, just because he liked to make people happy. Rhi and I would never leave his house without having been given something. Normally Unison branded! An icescraper, a lunchbox, a car airfreshener in the shape of an ambulance that smelt like bleach but Dad insisted was intense mint. We would ask him what he wanted for Birthday or Christmas and he would say ‘I don’t want anything’. So we had to try and come up with presents that he would like. Not always successfully. In fact, it wasn’t unknown for my Dad to say he was going to take things to the charity shop and for us to notice there were gifts we had given him amongst the donations. Once, Dad was in a charity bookshop and picked up a book about Cuba that had caught his eye. He opened it to find a handwritten dedication to him with lots of love from Rhian on his birthday so then had to buy it back! Dad loved a joke and he enjoyed being quirky. Once, Rhian had a dream that she had handed in her notice at work but that she had written her notice on a potato. Dad loved this and a few months later when Rhian’s birthday came round and we had forgotten the dream story, Rhian opened a wrapped potato with a birthday greeting written on it! Talk about making dreams come true! Dad and Rhian always had a shared sense of humour. Rhian remembers when she was a lot younger, her and Dad going out for a wonder around the shops. In Clinton Cards there was a display of small teddy bears, each holding a letter and positioned pride of place at the entrance to the shop. Dad arranged the bears in to a variety of swear words which they both found hilarious, continuously so in fact as they checked back on their creations throughout the day. While Dad was a proud Liverpudlian, he really loved London. He knew London very well and was always on the lookout for good bars, good restaurants, places of interest, places to go, stories to tell. He was a great tour guide. 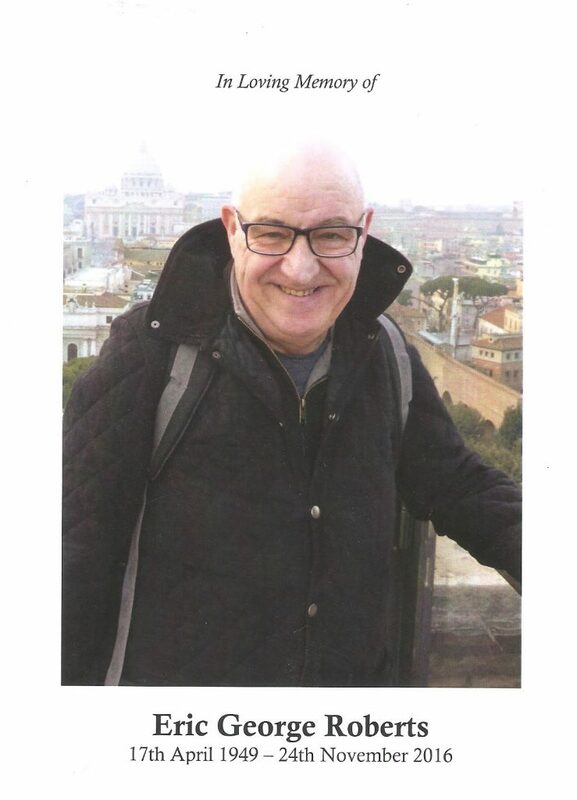 When he first moved to London he would ride the tube and get off at random stops and go to the nearest pub to familiarise himself with different districts. He lived in a wide variety of places in his early years in the city. Once when working on the ambulance he was called to a big house in Hampstead that had been returned to a house after having previously been split into small apartments. Dad told the patient, ‘I used to live in your kitchen’! Nothing was ever given to my Dad, he worked so hard and he achieved so much. He dedicated his life to the London Ambulance Service and its staff by his work with Unison and before that NUPE. Dad had decided to join the LAS after seeing an ambulance driving down Oxford Street and thinking ‘that looks like a good job’. As my Dad was at work, he asked his mate to go into an ambulance station and ask how to apply. Perhaps proving that ambulance people never really change, when told that he had a friend that wanted to join the man in the ambulance station said ‘you don’t want to join this firm’! But Dad did want to and that’s exactly what he did. Dad trained at LAS Headquarters in Waterloo and always said that in those days training used to consist of driving the ambulance around the block and as long as you didn’t run too many things over then you’d get the job. Maybe Dad wasn’t a highly trained clinician but he was a great ambulance man because he was kind and always saw the best in people. That’s not to say he was soft, Dad was never afraid to say something that he thought needed to be said and was happy to stand up for himself and for other people. He loved ambulance workers and was a natural trade unionist, proud to represent workers interests. His hard work and dedication in the union did not go unnoticed or unappreciated and, for this year, he was named President of Unison. An amazing achievement that we were so proud of. He made lifelong, loyal friends with trade unionists both in this country and abroad. His work in Cuba with Cuban trade unions has left real legacies and made real differences to normal peoples lives. He was a loyal union man, a loyal Unison man and no more so than to his colleagues in the LAS Unison Branch, the Bulldog Branch! They were his loyal lieutenants, his friends and his Presidential Guard. We have a million memories of Dad and all of them are good. Because Dad didn’t do negativity and he didn’t do hate. He was the man we went to when we wanted to be inspired and we did that daily. My Dad didn’t want to get old and he didn’t want to retire. And now he doesn’t have to. My family and I are so, so proud of him. We will carry you with us for the rest of our lives Dad. You’ll never walk alone. If Eric had been here today, he would not have allowed you to be sad. He would have brought a smile to your lips, he would have made you laugh. He had this ability to lighten the mood, however sombre the occasion, probably, as Rhian remarked to me earlier, by making some totally inappropriate remark. Well, I’m not going to try to compete with that. I simply want to say, on behalf of Eric’s brothers – Ken, Ray, Alan and myself – how much we love Eric, how much we miss him and how his passing has left a huge Eric shaped hole in our lives that will never be filled, can never be filled. People have asked me what Eric was like as a child. Well, he was a very good and dedicated sportsman. 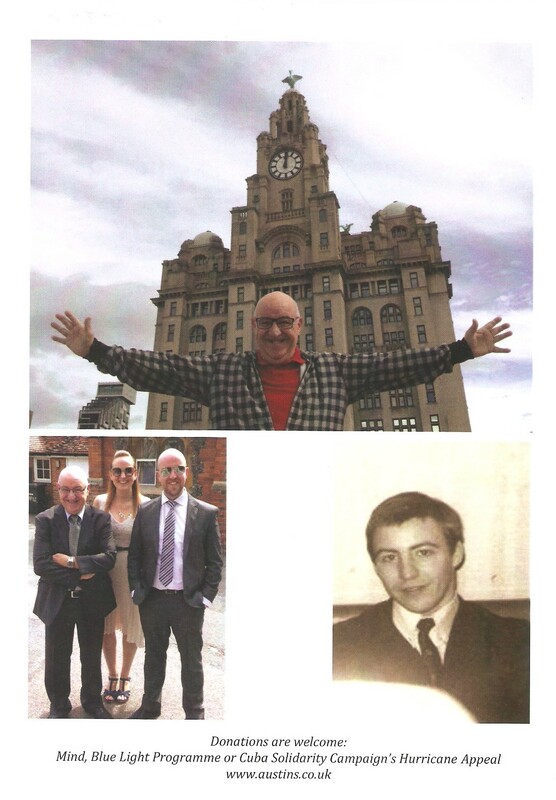 As a boy, he had trials for a number of professional football clubs and he became a very proficient runner, competing, we think, on behalf of Liverpool Harriers. However, the thing I remember most about the young Eric was that he had a lot of what our Dad called “cheek”. From a young age our Eric thought his mission in life was to tweak the noses of those in authority. Since our Dad could not abide “cheek” there was the potential for some ugly scenes. But Dad, like us, like the world in general, found it impossible to be angry with Eric. How can you be angry with someone while he is making you laugh at yourself? And this is our abiding memory of Eric – his capacity for humour. At family gatherings, he would have us all aching with laughter as he recounted his latest involvement in some highly improbable and utterly bizarre event, always with a cast of unbelievably eccentric characters. Surely, no one person could possibly experience such a succession of comic misadventures? But Eric told these stories with such conviction, such plausibility, mimicking to perfection the voices and intonation of all the characters, that we were forced to believe him. Eric was a talented raconteur. Eric could see the funny side of most situations. But not everything to Eric was funny. He was a man of passions. He was passionate about and fiercely defensive of his children, his family and his friends. He was passionate about his trade union, UNISON, and the members he represented and he was passionate about the plight of the Cuban people. Perhaps most of all, after his family, Eric was passionate about Liverpool Football Club and the saintly Bill Shankly who in Eric’s view, if not able to walk on water, at least could wade through it ankle deep! If you have not already heard Eric’s tribute to Bill Shankly on YouTube then it is well worth a listen. It is masterly. Again, he was a boy and a man with a pronounced and disabling stammer who, by sheer force of character, determination and grit, turned himself into a very accomplished public speaker. No wonder we admired him. Well, Eric, you have lived a good life. A life full of achievement. A life spent in the service of others. We love you so much, we admire you, you made us laugh. As long as we live we will never forget you. So, rest in peace, mate. Rest in peace.